The Territory of Dakota was an organized incorporated territory of the United States that existed from March 2, 1861, until November 2, 1889, when the final extent of the reduced territory was split and admitted to the Union as the states of North and South Dakota. 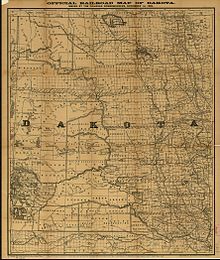 The Dakota Territory consisted of the northernmost part of the land acquired in the Louisiana purchase in 1803, as well as the southernmost part of Rupert's Land, which was acquired in 1818 when the boundary was changed to the 49th parallel. The name refers to the Dakota branch of the Sioux tribes which occupied the area at the time. Most of Dakota Territory was formerly part of the Minnesota and Nebraska territories. When Minnesota became a state in 1858, the leftover area between the Missouri River and Minnesota's western boundary fell unorganized. When the Yankton Treaty was signed later that year, ceding much of what had been Sioux Indian land to the U.S. Government, early settlers formed an unofficial provisional government and unsuccessfully lobbied for United States territory status. Three years later President-elect Abraham Lincoln's cousin-in-law, J.B.S. Todd, personally lobbied for territory status and the U.S. Congress formally created Dakota Territory. It became an organized territory on March 2, 1861. Upon creation, Dakota Territory included much of present-day Montana and Wyoming as well as all of present-day North Dakota and South Dakota and a small portion of present-day Nebraska. A small patch of land known as "Lost Dakota" existed as a remote exclave of Dakota Territory until it became part of Gallatin County, Montana Territory, in 1873. Dakota Territory was not directly involved in the American Civil War but did raise some troops to defend the settlements following the Dakota War of 1862 which triggered hostilities with the Sioux tribes of Dakota Territory. The Department of the Northwest sent expeditions into Dakota Territory in 1863, 1864 and 1865. It also established forts in Dakota Territory to protect the frontier settlements of the Territory, Iowa and Minnesota and the traffic along the Missouri River. Following the Civil War, hostilities continued with the Sioux until the 1868 Treaty of Fort Laramie. By 1868, creation of new territories reduced Dakota Territory to the present boundaries of the Dakotas. Territorial counties were defined in 1872, including Bottineau County, Cass County and others. During the existence of the organized territory, the population first increased very slowly and then very rapidly with the "Dakota Boom" from 1870 to 1880. Because the Sioux were considered very hostile and a threat to early settlers, the white population grew slowly. Gradually, the settlers' population grew and the Sioux were not considered as severe a threat. The population increase can largely be attributed to the growth of the Northern Pacific Railroad. Settlers who came to the Dakota Territory were from other western territories as well as many from northern and western Europe. These included large numbers of Norwegians, Germans, Swedes, and Canadians. Commerce was originally organized around the fur trade. Furs were carried by steamboat along the rivers to the settlements. Gold was discovered in the Black Hills in 1874 and attracted more settlers, setting off the last Sioux War. The population surge increased the demand for meat spurring expanded cattle ranching on the territory's vast open ranges. With the advent of the railroad agriculture intensified: wheat became the territory's main cash crop. Economic hardship hit the territory in the 1880s due to lower wheat prices and a drought. North Dakota and South Dakota became states simultaneously on November 2, 1889. President Harrison had the papers shuffled to obscure which one was signed first and the order went unrecorded. Dakota Territory was the setting for the syndicated western television series, Man Without a Gun, starring Rex Reason as newspaper editor Adam McLean and Mort Mills as Marshal Frank Tillman. The program aired from 1957 to 1959. The Disney musical film The One and Only, Genuine, Original Family Band takes place in the Dakota Territory during the time of the 1888 Presidential Election. Dakota Territory was the setting for several novels. Five books in Laura Ingalls Wilder's Little House on the Prairie series, namely By the Shores of Silver Lake, The Long Winter, Little Town on the Prairie, These Happy Golden Years and The First Four Years, were set in Dakota Territory. Ole Rølvaag's Giants in the Earth, a novel about Norwegian pioneers, was set in southeastern Dakota Territory. The story was later adapted as an opera by the same name, which won a Pulitzer Prize for Music in 1951. Dakota Territory is the main setting for the HBO TV series "Deadwood". The city of Yankton and the Black Hills area are mentioned often in the show. HBO fictional series Deadwood set in the Black Hills in the town of Deadwood in 1876. ^ "Beyond 50: American States That Might Have Been". npr.org. Retrieved March 14, 2018. ^ a b c d Heather Cox Richardson, Wounded Knee: Party Politics and the Road to an American Massacre, Basic Books, 2013 ISBN 0465021301. Dakota Territory Centennial Commission (1961). Dakota Panorama. Dakota Territory Centennial Commission. OCLC 2063074. Lauck, Jon K. (2010). Prairie Republic: The Political Culture of Dakota Territory, 1879-1889. University of Oklahoma Press. ISBN 9780806141107. OCLC 455419815. Waldo, Edna La Moore (1936). Dakota. The Caxton printers, Ltd. OCLC 1813068. Wikisource has the text of the Encyclopaedia Britannica (9th ed.) article Dakota. "Dakota, a territory of the United States" . The American Cyclopædia. 1879.